Nanofiber scaffolds are being evaluated for wound healing and are used to generate artificial organs...enabling new approaches to tissue engineering and regenerative medical research. Nanoscience Instruments is proud to introduce the Fluidnatek® Electrospinning and Electrospraying line of nanofiber and nanoparticle fabrication instruments from Bioinicia. The electrospinning and electrospraying equipment scales from table-top equipment for the lab to fully automated pilot plants and equipment for industrial manufacturing. All equipment is functionally identical: recipes developed on the table-top R&D system are guaranteed to run and produce identical results on the industrial system. Fully scalable from lab to fab. These cutting-edge instruments utilize electro hydrodynamic atomization (EHDA) to fabricate both nano- and micro-structured materials. The diverse and broad applications of the Fluidnatek® line include scaffolds and implants for regenerative medicine and biomedical applications, packaging of food additives and bioactive substances, nutraceuticals, pharmaceuticals, cosmetics, novel materials for functional textiles and advanced filtration, plus more. The core of the Fluidnatek® line is eStretching technology, a proprietary multifunctional mono- and multi-axial electrospinning and electrospraying process. Based on the classic principles of electrostatic electrospinning and electrospraying, eStretching combines a novel emitter design and controlled fluid delivery systems to yield stable and reproducible size controlled fiber and particle fabrication. This novel process overcomes the typical hurdles that has made the scale-up and industrial adoption of electrospinning so difficult in the past. The proprietary eStretching process combines high voltage with high gas flows to fabricate micro- and nanomaterials. Liquid flows through a capillary tube in front of a counter-electrode, which acts as a collector while high voltage is applied between the tube and collector. There is a range of electrical voltages where the meniscus anchored at the tip of the tube turns into a stable cone and a very thin liquid jet is emitted from its apex. Depending on the rheology of the liquid, the jet breaks up into droplets (electrospraying) or undergoes a whip-like motion (electrospinning). The system allows for tight processing controls including advanced environmental controls, allowing scalability of initial concept products to full-scale production. The system also allows users to control the size, shape and structure of the nanofiber or nanoparticle. Whatever the desired shape or size, flexibility was designed into the equipment. With the unique sterility requirements for Pharmaceutical, Biomedical and Food Manufacturing in mind, the equipment was designed to meet ISO and cGMP certification for drug, cosmetic and food product innovations. 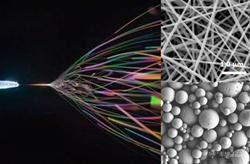 The Fluidnatek® was designed to manufacture a large variety of materials to be either spun or sprayed; any material in a solution, emulsion, or in any solvent can be used to create the nanofibers or nanoparticles. Electrospinning is an exceptional technique to generate size-controlled fibers of many different materials and non-woven mats of fibers. These non-wovens exhibit potential for a high active area and porosity. For more information about Nanoscience Instruments and the products and services they provide, visit us online at Nanoscience Instruments. For 15 years, Nanoscience Instruments has delivered a wide variety of analytical solutions to academia and industry. We specialize in surface science and nanoscale microscopy instrumentation, including benchtop scanning electron microsopes (SEMs), portable AFMs & STMs, 3D optical profilers, micro and nanomanipulation systems, as well as consumables and accessories for these instruments. More information is available from the Nanoscience Instruments website: http://www.nanoscience.com.